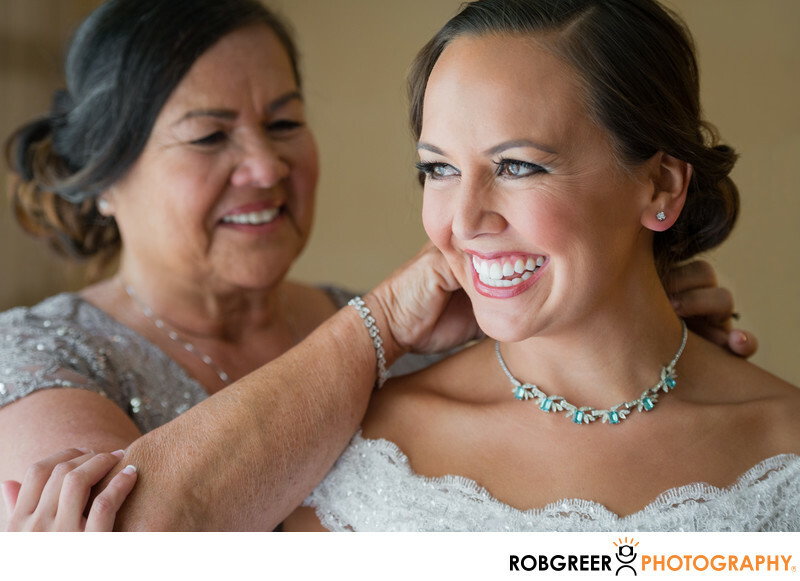 I captured this photograph of a bride getting ready at the Torrance Marriott in Torrance, California and it represents all that is wonderful about a mother helping her daughter get ready for her wedding day. There's so much joy and happiness in this photo along with the story that is quite obvious. Although this image looks completely candid, it is in fact a directed moment. In a natural part of everyday life, we seldom stand in beautiful light in front of clean backgrounds perfectly positioned near other people. In order to capture moment like this, I first Place the bride in an area near a window were beautiful light falls naturally on her. Then I asked her mother to stand behind her, slightly offset, and place the necklace or piece of jewelry on her daughter. During that process, I asked the bride to touch her mother. That is all the direction that I provide and it's all that is typically needed in order to achieve results like these.. Location: 3635 Fashion Way, Torrance, CA 90503. 1/100; f/4.0; ISO 500; 102.0 mm.